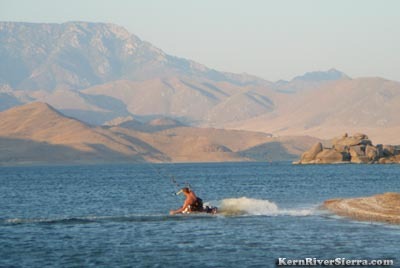 Carving up Lake Isabella with the power of a kite. Lake Isabella gets wind; a lot of heavy wind. Nothing but buttery wind, power, and the freedom to shred it whichever way you choose. 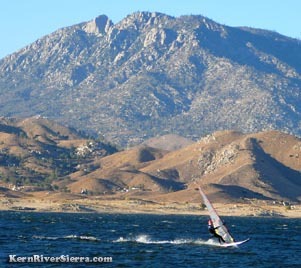 On days like that, a diverse and dedicated tribe of kiters and windsurfers predictably converge on the lake for a Southern Sierra style surf session. But be aware: this place can rock the heavy winds, it can be ultra gusty with tornado-like wind currents, it can get crowded with shore-lined motorhomes and drunk fisherman who - for reasons unknown - are attracted to the windiest spots on the lake, it can have sketchy launches, little room for error and no one to save you. But if you are comfortable with these conditions, it also can be as-good-as-it-gets PERFECT. Windsurfers loving the big Spring wind. An evening kiteboarding session. 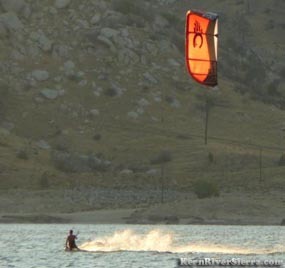 The best spot for consistent wind is known as "The Ghetto" near the Auxiliary Dam in the town of Lake Isabella. Its actually just downwind of the Old Isabella Recreation Site, where you need a USFS recreation day pass. Plenty of room for this late season shred session at The Ghetto. The Ghetto is the place to be when the wind is straight South. The websites WindAlert.com, iWindsurf.com, iKitesurf.com use a wind meter at the upper parking area here. Its usually fairly accurate, but expect heavier winds out in the lake. Note that the nearby Forest Service wind meters are not accurate for the kiting/windsurfing locations. 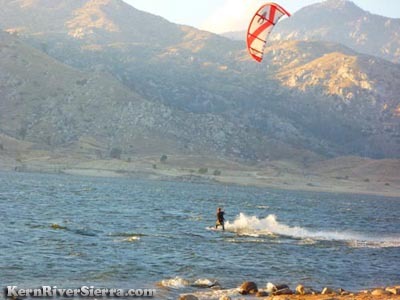 A video of Kiteboarders on the lake in the Fall. There are other nearby launch options; such as closer to the dam and over at Engineers Point. In the spring especially, the tendency is for the wind to turn Southwest. Unfortunately the wind gets gusty once there is too much West in it. Depending on how West it's blowing, there are other spots to try out. Coves west of Red's Marina, Kissack Bay, and Robinson Cove all can have good wind if the conditions are right. Depending on the lake's water level, the launches can range from sort-of-ok to horribly dangerous. Camp 9 can get good, and on rare occasions North Fork marina in Wofford Heights can blow (great launch here, but usually gusty). Sailing with a backdrop of Split Mtn. 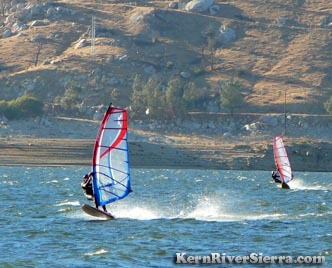 Also dependent on the lake level and Kern River flows, the Kern River Spit is one of the safest spots to kite. A large sand bar forms allowing several launch options, but the wind (needs South or even slight Southeast) is weaker than at the Ghetto. At the very least, this can be a great spot to fly a trainer kite and body drag. Note that during Spring river flows, this place doesn't exist. Spring. In a usual Spring, the lake gets heavy wind and blows almost everyday. It can get really gusty, but this is when the most windsurfers show up. A common kite size is 8m. Summer. There are days with the heavy winds, but it starts to steady and mellow out a bit. 8m-12m kites are the usual size range. If wind is in the forecast, there seems to be about a 50/50 chance of a good South direction. Fall. Everybody leaves and you have the place to yourself! Depending on the year, the wind can be the steadiest and most fun during this time. 10m-12m kites. Winter. How bad do you want it? Early winter can actually be surprisingly good with incoming and outgoing fronts, but bring your drysuit! You will certainly have it all to yourself! Wind Forecast for Lake Isabella Wind directions are not usually accurate.